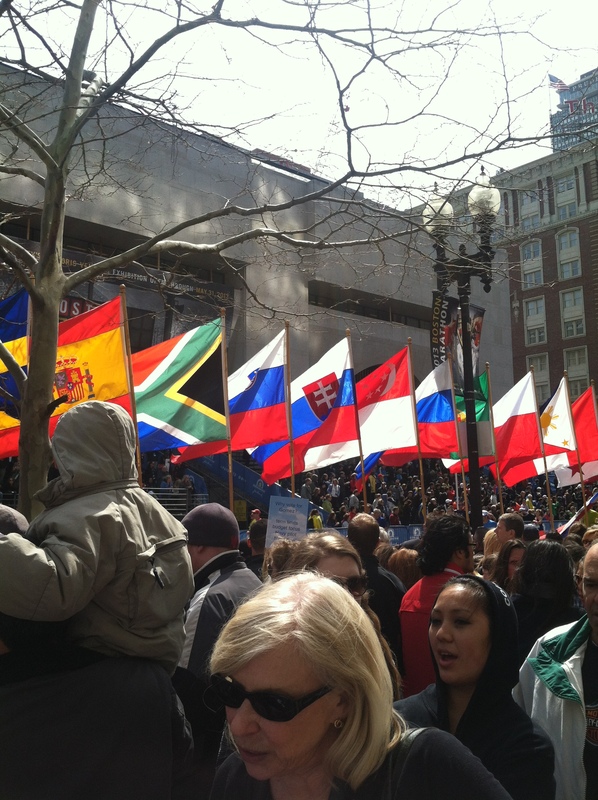 Boston Marathon+Bombings: Through the eyes of a spectator. Maybe you scored a spot near the finish line, maybe you were enjoying having your monday off from work, maybe you were drunk at one of the local bars with your buddies, or maybe you were a runner. Whatever the case, I’m sure you were not prepared for the events that were to ensue. Let me preface this by saying that this year was my very first “marathon monday” event. I started off my morning with a barre class at Sports Club/LA and opted to finally head down to the race around 1:30pm. It wasn’t long before I was stuck between the mass amount of people and all of the gates put up for the runners course. 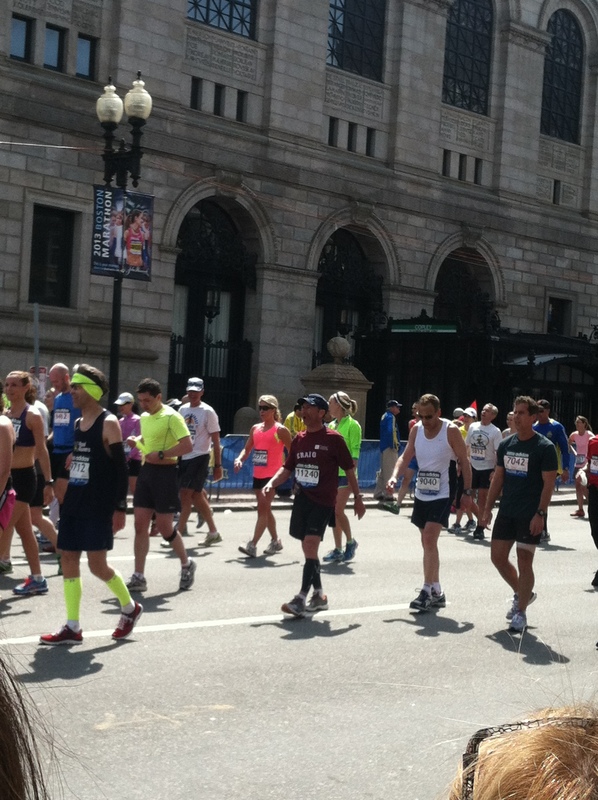 Finally after much bobbing, weaving, and rerouting, I made it to Boylston. I was on my way to meet up with two friends, who would later be spectators of the tragedy to follow, but just HAD to catch a climpse of these amazing individuals who put their sweat, tears, and hours of training into such an accomplishment. See running 26 miles seems kind of unfathomable to me. I don’t think my body could ensure such intensity. But these individuals make it look so easy and blessed with such talent and motivation. 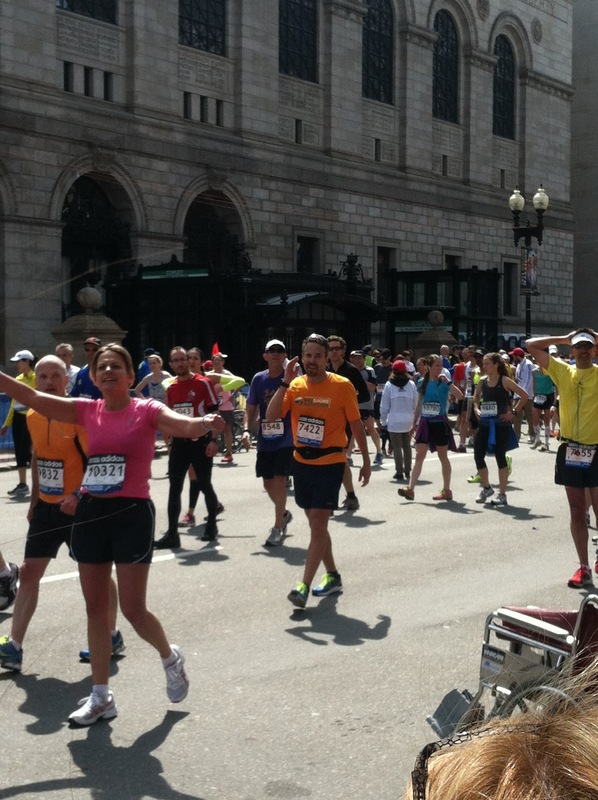 It was amazing to witness the camaraderie and boisterous crowds as people crossed the finish line. So uplifting. Of course, I couldn’t keep my friends waiting too long, so I continued my journey down boylston, finally crossing over mass ave to meet them at a cute little coffee shop. At this point its roughly 2pm or so. 45 min later we decide its time to head back to the race and just as cross over back to boylston, about 400 meters ahead we see and hear a huge explosion. 5 seconds later another one goes off. “That’s odd I think to myself..maybe its signaling the end of the lead runners?” Caitlin, my friend, is a bit skeptical. Her concerns are that it’s a gun shot..but “No way” I reply, “Guns don’t produce that smoke.” Within seconds, people start heading in our direction and cops start swarming towards the race. That’s when I knew deep in my gut that it was time to run and get out fast. Something was wrong. We quickly evacuated the scene and headed towards the Pru, where more people were evacuating. Finally, Caitlin begs us to sit down for a sec so that she can figure out whats going on. I immediately call my bf who is at work and urge him to turn on the tv and figure out whats going on. Im shaking and scared, but still cool and collected. I next text my mom and tell her Im okay. We sit near mass ave and watch as dozens of cop cars and fire trucks drive by; crowds everywhere, people crying, people of their phones. It’s a state of worry and panic. What happened to the racers? Is everyone okay? Is there more to come? As I walked home with the crowds, the sirens seemed to fade into the background as I tried to process what just happened. I felt terrible for family members looking for their runners and trying to get ahold of them. I also felt awful for the runners who were not able to finish. I would be livid! My bf’s boss was one of those who was running for charity who did not get to finish. I felt sick to my stomach and physically exhausted from the emotional exhaustion. Who the hell would bomb a marathon? Prayers and thoughts go out to everyone in the city in which I now live and to those that were injured and to the family and friends of the runners. It seems we are not safe anywhere and people are evil and crazy. I am so so thankful to have this day and to be safe and to have my bf back in my arms. It really taught me to never take any day for granted. This was truly an act of evil and I will be praying. #prayforboston. Lastly, I want to thank everyone who asked via text or on Facebook if I was ok. I am so thankful to have you guys in my life!